[Privilege] One person sticks like and juice or one sake holder gives their service. In the case of * accommodation charges of 13000 yen or more, it applies. [Reservation] Please ask by telephone directly. 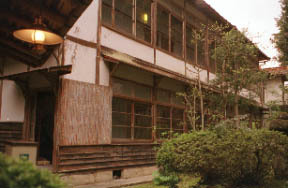 The period of a posting station consists of the storied inn which prospered as an "upper garden", 2 stories of wooden old wing and a Separate from main, and a new building.The open-air bath [ madam ] "it is the only claim of a house" may be national leading (most eye) in atmosphere.It is surrounded by the slightly elevated mountain, a little bird twitters, there is a courtyard which time raised, the yuya of the brilliant kind of cypress in which it is not lost was constructed, and it harmonized also with the old wing, and has made a wonderful atmosphere.It is a good char dish of a vigor overnight [ of a hidden hot spring ]. 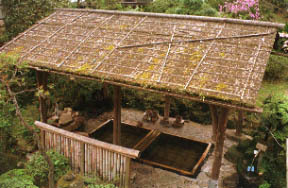 * Although Say of the Ryokan name "onseirou" was an old type, he substituted the new type. 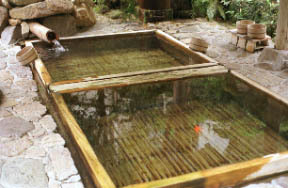 A tasteless simple spring odorless [ water-white ] is good for this atmosphere. Char and a dish of wild plants. The char which braced itself with the fish preserve carries out a vigor-enough mouth with relish, and is carried.Tender and chewy mouthfeel, a frank taste.A dish grilled with salt is as delicious as a Hoku-Hoku, and the char Sake which flavored by grilled fish baked thoroughly beautifully brown is the real thrill of a hidden hot spring to do at once. * A char Sake which flavored by grilled fish is a dish specially.No less than three animals have obtained the char called fish of the vision. wild grass (うど, Pteridium aquilinum, and royal fern - wiping - shiitake mushroom and specialty Japanese horseradish) and river fish (the char and carp which kept with the fish preserve which cleared up for a while, and braced itself), and autumn -- a mushroom - Chinese yam, winter November - a March -- a Matsuba clab. 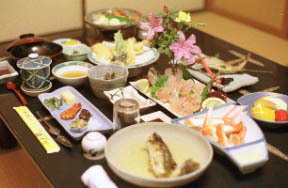 The example of 13000 yen: They are attachment, chawan-mushi, a char dish grilled with salt, tempura, a crab, a cooked in a pot, soup, and fruit into 8 sun (hors d'oeuvre) and a row slices. * Number of articles and the content change on a budget. char fullness course: -- the fresh slices of live fish arranged to look lifelike (more than the 4 persons), dish grilled with salt, and char rice steamed with vegetables of a 30cm over char -- it is in others -- absorbed in a trap. Meal place: Every morning and evening room foods. * the time more than 3 persons -- measure with a 10500 yen course. © 1999MOUNTAIN TRAD ® Inc.